This course will review and reinforce BodyReading™ skills, manual techniques, body use, structural strategies practice and fascial touch. If you’re just starting with Anatomy Trains or you want to see how the lines run around the body, this course will cover territory of each myofascial meridian including palpation, as well as the lines applied to movement. This course traces the 12 myofascial meridians, giving a guide to palpate the individual muscles, muscle groups, and fascial structures in each of the kinetic chains of myofascial strain transmission. Get a 3D sense of anatomical connections in the body, connected to what you can feel with your hands. 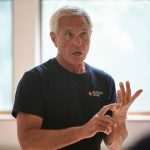 Don’t just learn the lines in your head, learn to feel them on the body, expertly guided by master bodyworker and author of Anatomy Trains, Tom Myers. You will be able to feel them on yourself and with your classmates to develop a “knowing hand”.